Wrap yourself in armor, and pick up the Overed Weapon, something that can turn the battlefield around with just one fire. 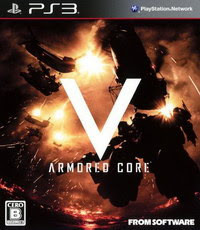 Armored Core V takes place after Amored Call 4 Call for Answer and will take players away from the clear fields into the cities. The game focuses more on strategies and tactics than firepower. The developers shrink the mechas to suit the dense urban landscape and enlarge the world map. The stages will be larger, the complex geography will give gamers more tools. Sneak up on an enemy quietly and make use of the various structures.